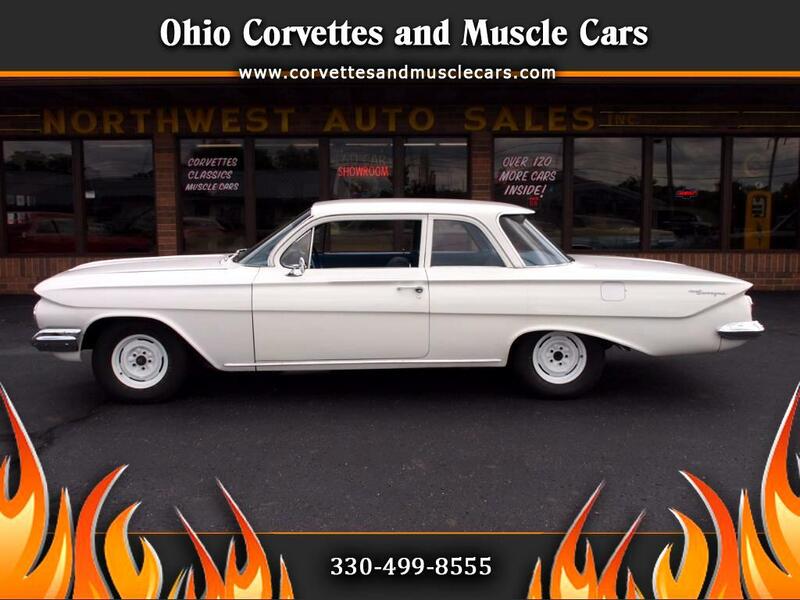 You're viewing a 1961 Chevrolet Biscayne 2 door sedan. In 1961 this was Chevrolet's entry level car in the full sized line. Most of them were outfitted with Chevy's work horse six cylinder and had either a 2 speed PowerGlide automatic or the iconic column mounted 3 speed manual affectionately known as the "3 on the tree" This particular example has been upgraded with a 409 cubic inch big block, with a solid lifter cam. The transmission is a Muncie 4 speed. Carburetor and distributor have been rebuilt. Carpet is new...windshield is new...as are the tires. This is a good solid southern bodied car. There are no rust issues with the body panels, and the frame is solid. There is some slight delamination on the edges of both vent windows. The original interior is in excellent shape with the exception of 3 small tears on the front bench. This cars drives very strong and is a blast to tool down the street in something that looks like Grandma's grocery getter, but will blow the doors off most of the cars sitting next to it at a stop light. If you're looking for a fun old time go fast car, this just may be the ticket. Message: Thought you might be interested in this 1961 Chevrolet Biscayne.